With Record Store Day approaching on April 19, the resurgent vinyl culture is stronger than ever. And the Internet, once predicted to be the Grim Reaper of records and record stores, is embracing the trend with some new art projects that are a beautiful fusion of old and new technology. First, there’s artist Halley Docherty’s new project commissioned by British newspaper The Guardian. 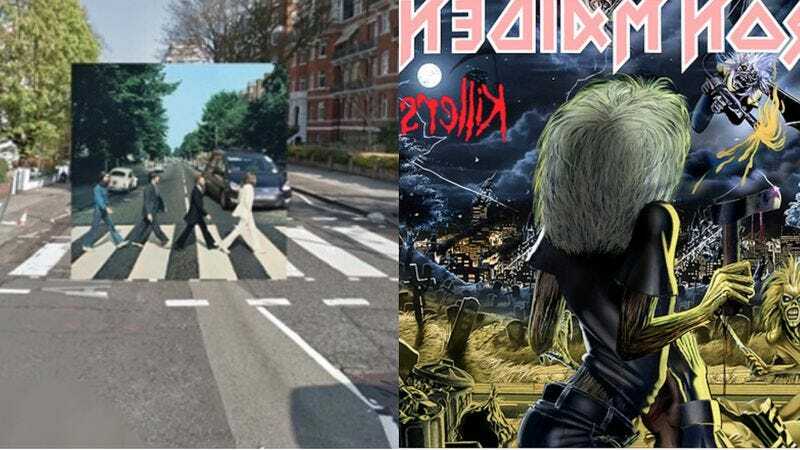 Previously, Docherty did a project placing famous paintings of cities around the world in their modern-day locations using Google Street View; now he’s doing the same thing with classic album covers in a photo set that shows how cities from Detroit to London have changed over the years. Some are below, but more can be seen at The Guardian’s website. Then there’s flickr user Harvezt, who’s created a series of illustrations called “Dark Side Of The Covers” that imagines what the rear view of some iconic album covers would look like. You can’t roll a doobie on them, but these imaginative, detailed, and remarkably faithful illustrations are still pretty mind-expanding. Check out the whole set on Harvezt’s flickr page.